NOTE: This post has been updated to reflect that the Senate bill amends federal law related to UOCAVA, not UOCAVA itself. Late last week, the election community got the latest in what feels like a series of unpleasant surprises: voting assistance officers (VAOs) – the individuals in each military unit with responsibility for helping fellow servicemembers with registering and casting a ballot – are facing extinction due to recent Navy action and a new federal bill. The Navy eliminated seven shipboard collateral duties in NAVADMIN 168/17, released July 11, and tasked a working group to further review all collateral duties for the potential to be eliminated or consolidated. The seven collaterals identified for immediate elimination were selected from a review of Fleet units and will have minimal impact to mission: Athletics Officer, Library Officer, Health Benefits Advisor, Community Relations Project Officer, Enlisted Safety Committee (Safety petty officers have not been eliminated, but the Committee will be combined into the Enlisted Safety Council), Knowledge Management Officer, and Voting Officer. 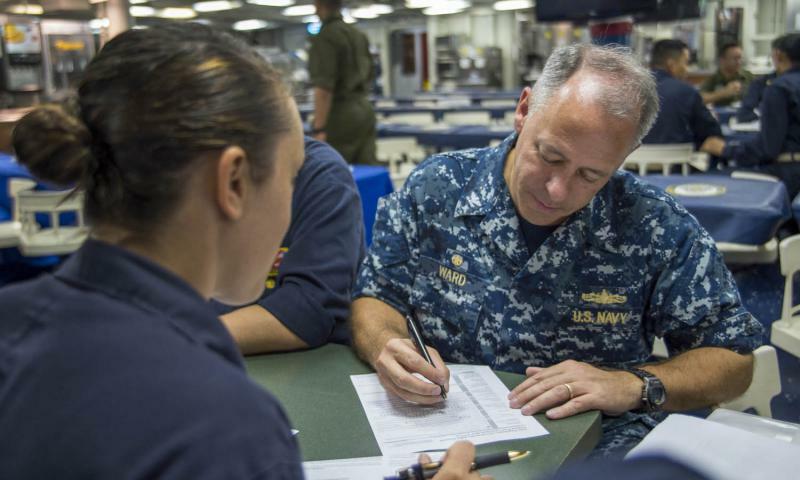 This effort is part of a larger objective to remove unnecessary burdens and distractions from Sailors to allow them to focus on core warfighting and to better allow leadership to evaluate Sailors on performance in their primary duties. Last week, U.S. Senator Mike Rounds (R-SD) introduced S. 1388, which would amend federal law (10 USC § 1566) related to the Uniformed and Overseas Citizens Absentee Voting Act (UOCAVA) to eliminate the requirement that all branches of the military provide VAOs. While it isn’t entirely clear they’re linked, the timing of the bill suggests it was prompted by the Navy action. At this point, no action has been taken on the bill other than referral to the Senate Armed Services Committee. When a unit will be underway during an election, VAOs are the folks who think ahead and grab a stack of absentee ballots and a few educational resources to help Sailors vote successfully. Why is this important? Unfortunately, absentee voting isn’t a simple click of a button on some website, yet. It’s a finicky, manual process, and anyone who has voted overseas before knows this. So, when everyone else in the unit is scrambling to complete pre-deployment items and tending to family issues, it’s useful to have one person who ensures that the unit is prepared for this process. But a good VAO continues to add value as the election draws near. He or she can answer the host of inevitable questions that arise when people start trying to submit their ballots. After all, if you don’t fill the ballot out correctly, it won’t count. And perhaps most importantly, a good VAO reminds everyone that they CAN’T wait until election day to submit an absentee ballot. It’s not like going to the polls. The key to success is thinking ahead, especially if outgoing mail is on a discrete or restricted schedule. In this sense, a VAO can help their entire unit cast successful ballots and mitigate a host of complications. A quick suggestion: Don’t gut the program. Improve it. Navy leadership should work directly with FVAP to scrap the needless admin that VAOs hate. Identify the pain points and make the program more accessible to Sailors while preserving its utility. That would be a win for everybody and a more practical path than what’s been proposed. Fundamentally, the people serving our country should be afforded the resources to successfully vote for their bosses. This seems only fair. I don’t think of this task as too small or menial for any one Sailor to devote a bit of time to. Abraham’s suggestions make sense to me; while I am sympathetic to the idea that servicemembers should not be distracted unnecessarily from their primary duties, I think you can make a pretty good case that helping people who defend our democracy to cast their own ballots should be a (small, but important) part of the military’s mission. Be the first to comment on "VAO Positions in Jeopardy as Navy, Senate Bill Consider Cuts"